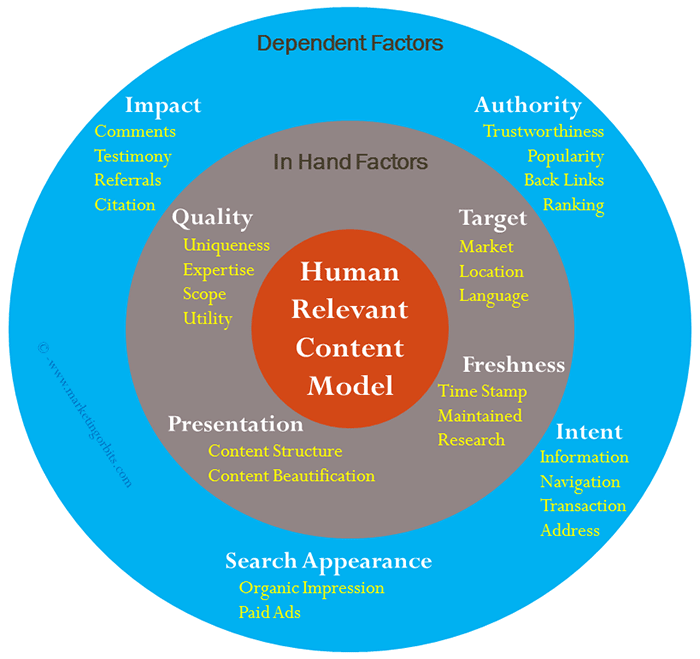 Home > Highlights > Human Relevance Content Model for advanced SEO and highest SERP position! More than a decade of extensive work experience on Internet Search Queries and learnings through understanding the Search Relevance behind each type of Query Intent make me capable of writing on this SEO chapter of huge possiblities. Til date, it remains a very little talked topic except a few online search geniuses like Matt McGee. I foresee that in coming years, Online Marketers and SEO Experts would need this model more intensively for advanced annotation of search keywords and user search expectations. “Yes, Bing Has Human Search Quality Raters & They Judge Web Pages”. He throws light on 4 factor theory of reading user’s mind used by Bing as Intent, Scope, Authority and Quality. He extends his elaboration with measurement method details used by Bing Rating Matrix to understand the user likeliness and user satisfaction . She gave this process a steady name as “how Google makes algorithm changes”. So here by making the basic pitch of the subject, let’s now talk in depth and try to shape up all of these psychological factors in a model form. ‘Dependent Factors’ are the factors which decide your content’s public acceptance and most of them are decided by user taste. Expertise: Lee Federiksen on hingmarketing.com emphasises on expertizing the writing of News-letters, Blogging and White papers (e-books) as 3 of his 10 gradients of “10 Online Lead Generation Techniques for Professional Services” artilce. Here I can add up on the basis of my personal experience that write it like a story telling by including your knowledge & experience; it settles the memory base for your content in reader’s mind. Scope: Little below in this article we will talk about four types of online search intents viz-a-viz Navigational, Informational, Transactional and Address. Generally you see three types of intents but I take upon the 4th one as tracing of Address using Google Map etc. because general navigation perception is more about surfing online content (which can cover up annything and/or everything) while address looking is specifically about tracing of direction towards an address. So before sarting writing on a topic, author should ask to self that with which of the 4 intents he/she would like to relate their article the most. How much relevancy your content will set with either of user search intents. When you are ready with answers to these questions, you are almost decided on going to be scop of your article. Utility: While scope is about relevancy of your content, utility is about satisfaction. And satisfaction grading depends on how narrowly or broadly your audience will be satisfied with your content. Mett Jesell on marketingland.com says that, “The Keys To Quality Content Are Information Density & Utility”. I relate information density to expertise (talked in first point above) and expertise yields relevancy thus utility. cites in his research entitled “Viral marketing: Motivations to forward online content” that the act of forwarding (citing/referring the ultimate activity of creating impact and authority) online content happens due to four potential motivations: (1) the need to be part of a group, (2) the need to be individualistic, (3) the need to be altruistic, and (4) the need for personal growth. Professor’s research results show that Internet users who are more individualistic and/or more altruistic tend to forward more online content than others. So to be in eyes of such content forwarders and to garner the best of their content forwarding habits your content should be as par their utility and forwarding motivations. “Using examples to back up statements of fact can add value to your writing”. “Uniqueness is important to our society and our world”. So being unique has a huge scope for appeasing the people looking for unique content by serving them with unique content. Simply segmentise your content wherever possible! Freshness: Usually a common reader measures the freshness of a content by looking at its inception date i.e. time-stamp with captions like ‘Published on or Last updated’ but on broad technical ground it is the intense research around your subject which ultimately holds the key to quench the thirst for freshness. Search queries oftenly related to informational intent such as news and upcoming events along with describer words around them like latest results, breaking stories, how to, updates on/of, and queries with transactional intents such as buying or downloading usually expect the most recent and fresh content. “10 Illustrations of How Fresh Content May Influence Google Rankings“. “Freshness brings more engagement, better rankings, low bounce rate and high search traffic to your content“. Beside time-stamp and instense research, articles without broken links and/or missing images is next important indication to user that your content is up to date and still thrills in competition. Associated query intents such as demise, transfer, name change or address change would change with time. A regular eye should be kept on these factors to further keep your content generating impressions of freshness. Content Presentation: A well-structured and beautified content generates professional image of your content. ‘Content Structure of Article or Blog’ section of my recent article entitled as ‘White Hat On Page SEO Practices in 2017’ throws light on importance of having Text Navigation Blocks, Content Richness, Links insertion & beautification, Social sharing features and management of user generated content such as comments, testimonials etc. in your write-up. As versed as is your content so favourite you will shine before Search Engines and your readers both. Target: ‘Impact’ one of the dependent factors of our model is closely related to this in-hand factor thus as precisely it is fixed so powerful will be your targeting. In Online Search world targetting usually counts for Market Targeting, Language Targeting and Location Targeting. Where geography bounds your reach to a specific continent, country, state or city; taste traverses you through the specific audience of that taste throughout world. Language targeting can be set up to one to three language sets around a content. third language target can be dialects of a language (often the language of a state with in a country) for example European-Canadian dialects of French are Belgian French, Swiss French, Aostan French, Quebec French and Acadian French. So choose the best combination of your language target set fitting to your purpose and market interest both. Location targeting deals with how well you know about your fittest search keywords around a specific location, landmark or building. Whereas market targeting is a bit of pushing activity, location targeting slides with pulling activity. So if your business or purpose relates closely with some specific locations then include them in your writing and targetting both. For example if you develop some content/article around a keyword ‘Eiffel Tower’ then using its direct or surrounding by location words like Paris, Trocadero, Champs-Elyse, Seine River etc. would be a brilliant idea to create best of location impact. Thus reaching the right audience of your taste, of course by knowing your targeted market, language and location creates magnetic impression. Intent: So far and perhaps the oldest and earliest classification of intents is concenred, we can refer to Rand Fishkin founder of moz.com write-up of 2007.
finding or tracing a geographic address online. Though navigational intent does most of with navigating through an online entity as a whole such as a website, directory or blog, and very little to do with individual articles or information. Informational Intent is perhaps the most curious case out of all intents which demands most qualified efforts. Users of this intent usually search for a particular peice of information around a topic or subject; even a single page article out of hundreds on your site can set you in reader’s mind permanently. Transcational and Address intents have similar kind of impact because both deals with technical presentation of your content instead of more grammatically corrected lexical content like the case of Information intent. Authority: Good will and technical assurance form the spine of authority. Good will is pertained to popularity and trustworthiness of your website, which comes with time and disciplinary efforts. Discrete pro-active approach and thinking behind each content set the mark of your authority over the subject. Focusing on earning as much as possible quality backlinks can be the best policy of generating your good will authority. 4) Browser Extension such a Webutation, WOT, Trustpilot. Tom Schmitz at searchenglinland.com says that “Classic SEO divides itself into four quadrants based on on-site vs. off-site and relevance vs. authority“. Impact: It is measured by the number of citations, comments, referrals and testimony your article got from readers. So be active in monitoring and managing these factors after your article is published. After back-links these feedback gaining components are tactful in generating big impressions about genuity of your content thus brand. So whenever receives a valuable remark, take special time to approve it. And if it is from a well known person or authority of the subject then it proves to be icing on the cake. Search Appearance: The biggest benefit of advanced keyword planning is that you can use them in your meta tag list for appearing in organic searches, in AdWords Ads display for paid promotions. As much as you appear in organic and paid SERPs so increased will be your Click Through Rate. The best and oneline output of this article is its ‘Human Relevance Content Model’. On the basis of my energy, knowledge, experience and mind put in it, I can say that this model represents a check-list necessary for creating relevant content. Same time I also agree to the fact that it has further scopes of work in it. But while proposing this model to the world of Online Search and SEO, I am confident enough in asserting that this model may serve as a stepping stone in understanding standard psychological science behind each search query. It combines maximum of components required for annotating a search term. Now it is your turn! I would like to hear from you how this model is going to help you or how you are going to use it or what else should be included or excluded from it? So kindly take a minute or two by sending your comments in comment box below to further help me in designing my further action course on this subject! Cheers!